A month has come and gone already! Where oh where do the days go? My birthday is coming up in March – so we’ve got some fun plans for that, and I’m also hoping to get my novel edited by the end of march! Big plans. Big plans. ~I did survive my dentist appointment, but came away with some disheartening news that I’ll share in my Feb health update (probably next week). ~Not sure I’ve spoiled my OH like I was hoping to. The biggest thing I’ve been focusing on is trying to keep him supplied with juice. And keeping Abby away from him so he can nap on the weekends. Find a local charity that accepts knitted/crocheted items – anyone have suggestions? 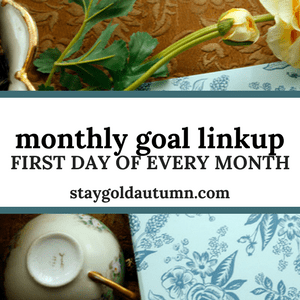 Check out the linkup below to read some fabulous bloggers goals as well!